Until now, we all thought that nothing would top “Red Flavor,” Red Velvet’s biggest feat that was even blared at North Korea, where K-pop is forbidden. But with the act’s new seasonal album, Red Velvet proves that it does not linger in the past, but instead takes itself to the next level. One might need to push the replay button twice or three times in order to fully vibe with “Power Up.” But soon you’ll find yourself humming the song’s quirky chorus anytime, anywhere, especially the part where the vocals hum “Banana-na-na” on top of the quirky chiptune. Why suddenly “Banana”? Don’t ask, since defying logic and norm is Red Velvet’s style. Pop-R&B “With You” is a pleasant mix of summery and wintery vibes, as the song compares spending time with a romantic partner to enjoying Christmas. The song, which flows like a shimmering placid river, is an obvious product of S.M. Entertainment. Changing the temperature, Red Velvet steps into a jungle with “Mr. E,” a dynamic song rich with quirky sound effects that are reminiscent of animals in a jungle. The song is also littered with brilliant word play, with the title “Mr. E” pronounced as mystery. Although “Power Up” fronts the album, “Mosquito” is the real gem here, as it equally shows every member’s artistic charm either through rapping or singing. Likening an annoying person to a mosquito, the song is highly likely to become one’s favorite earworm due to the infectious hook where Irene hums “na-na-na” and “zzz,” mimicking the sound of a mosquito. 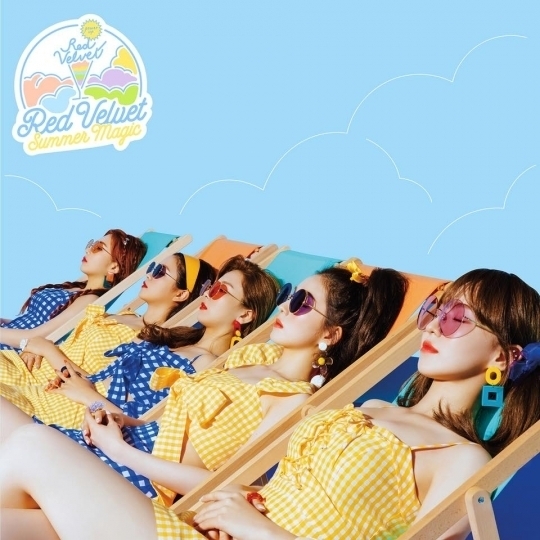 The festive atmosphere peaks with thrashing drum beats in “Hit That Drum,” the ultimate dance track overflowing with rock-EDM instruments and exuberant synths, and the freshness of “Blue Lemonade,” a track so summery that it may turn water into lemonade. Rounding out the album is the English version of “Bad Boy,” the group’s previous song, in which the members, especially Wendy, flaunt their fluency in English. Gone are the days of “Red Flavor,” welcome, “Power Up” era.